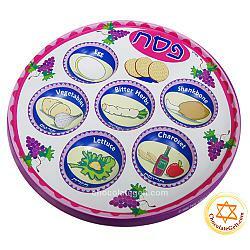 ABOUT THIS PRODUCT: Plastic Seder plate. Diameter 9.5 inches. Elegant traditional design by Israeli artist. 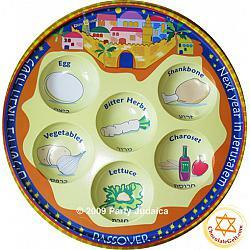 Disposable Passover Seder Plate Grape Design (PACK of 10) by case. When you order in bulk case quantities you save the most. We hope you enjoy the savings and share your findings at Chocolategelt.com with your friends. If you have any questions about this option or need a quote for greater quantities than you see online, please don't hesitate to ask. We love hearing from you! Free shipping and more discounts! 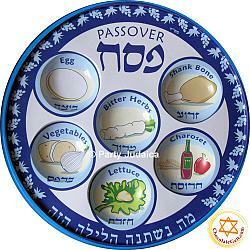 Chocolategelt.com is your online source for Disposable Passover Seder Plate Grape Design (EACH). We serve schools, synagogues, non-profit organizations, as well as individuals. 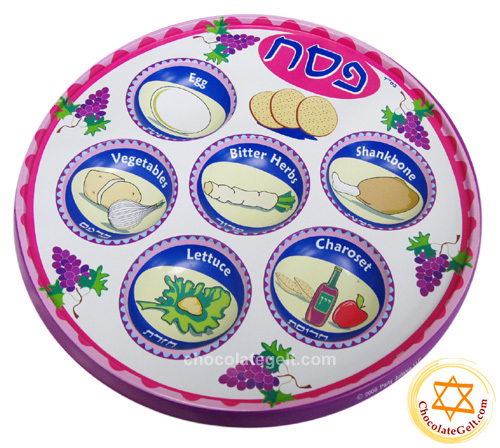 Disposable Passover Seder Plate Grape Design (EACH) sold retail and wholesale, you can see price break depending on quantity you buy on each product page. Our popular products are dreidels, chocolate coins also known as gelt, candles and party gifts for Chanukah. Our selection also includes wide variety of Purim supplies Thank you for shopping at our store!